Create customizable Easy popup if you want to show customers some announcement(s) on any position if your website. You can add and activate as many notifications as you want. Step 1: Administration > Embeddable elements > Easy Popup > on General tab click sign + (“Create new widget”) in top right corner. Pick a name of your Widget and position in a webpage and click Save. Step 2: On Install tab find a unique code for your Easy popup widget. Paste the code into your site’s HTML code anywhere inside BODY element (after <BODY> and before the </BODY> tag). After setting up your Easy popup widget, edit current notifications or add more of them. Notification or announcement for your customers will be shown in Easy popup widget and it can be customized to your needs. 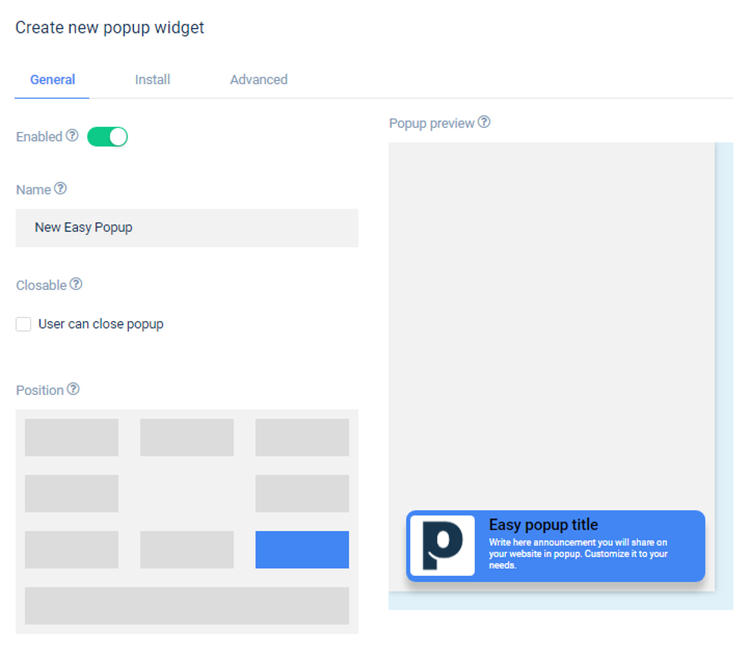 Step 1: Go on Administration > Embeddable elements > Easy Popup > and from a drop down menu choose Easy popup widget that will contain notification you’re editing. Step 2: Click on “Add Popup” button and fulfill data about the announcement you want to transfer to your customers such as message, picture, color, and other options. After that click on Save. Step 3: In every moment your popup can be Active or Inactive, depending on your situation. If you want to make some changes, simply click on Edit icon next to Popup name.